Yoo Baek, former idol group member, is now a popular singer and actor but he doesn’t try to be a good guy to attract people. He is self-centered and he is brutally honest to others even if it hurts them. For that personality, Yoo Baek makes big trouble for himself and travels to a faraway island to getaway. In that island, he meets warm people, including Oh Kang-Soon. She runs a small supermarket and also dives to pick abalone and sea mustard. She is physically a very strong woman. Yoo Baek (Kim Ji Suk ) was once a member of an idol group. Now he is a popular singer and actor. However he doesn’t try to be to be a nice guy. He is rather selfish and sometimes overly honest to people even if it hurts them. His personality often gets him in trouble. Once he makes a big mistake and decides to go to a faraway island to wait until the hype subsides. 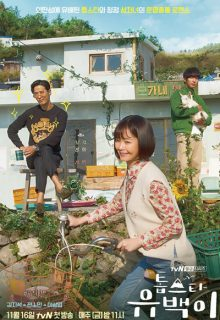 There he meets nice people, including a girl named Oh Kan Sung (Jun So Min) who runs a small shop and is physically very strong.